Gorgeous Argyle Pink Diamond Dangling Earrings - Investment Grade! Don't miss an opportunity to invest in Argyle Pink Diamonds while owning a beautiful piece of jewelry. 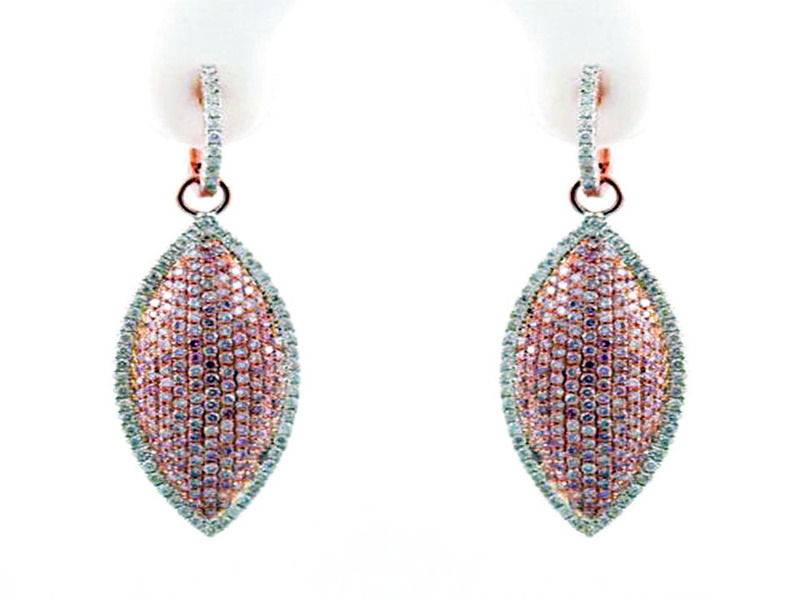 These Argyle Fancy Pink Diamond Dangling Earrings have been designed into a pair of gorgeous marquise shape, top fashion style earrings that measure 1.5 inches from bail to bottom tip. Our designers have spared no expense by using only the finest material so we've included these stunning earrings as part of our elite 'IGYSL Collection'. You'll find VS clarity on both the Fancy Pink and White Diamonds. All stones are round cut shape with excellent cut on each to ensure the maximum scintillation is present for stunning fire & sparkle of your top quality diamonds. Argyle Fancy Color Diamonds continue to increase in value 3x year on year and given the impending mine closure in 2020, analyst predict prices are going to sky rocket outpacing its current growth rate. Now is the time to invest before the deposit is tapped out. IGYSL has a direct source into Argyle Mine in Australia, with the same suppliers as the big name design houses, but we can offer more competitive prices given that we have smaller overhead. For example, compare these same quality earrings at Tiffany & Company, Cartier, etc at $37K+. Treatment Disclosure: Not Enhanced (N): 100% Natural, Straight from Mother Earth. Click the button below to add the Gorgeous Argyle Pink Diamond Dangling Earrings to your wish list.